Staff Lead horse or pony rides For any age! Make it a day to remember! Our well-mannered lesson ponies and horses provide a safe introduction to horses. Our staff will assist you in grooming the pony or horse. Our staff will then take you and one guest for a half an hour staff lead ride in one of our riding rings. Perfect for anyone over the age of two for their first horse experience! $50.00 and our staff leads the pony. Available seven days a week during the summer, by appointment only. During the winter, by appointment only. 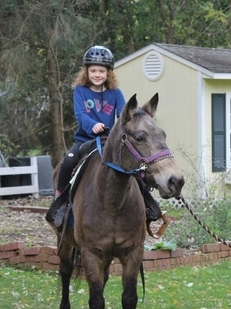 Pony rides can be scheduled by booking online. Please click the link below to schedule an appointment. Your credit card will not be charged, cash payment due upon arrival. ​There is a $5 deposit and booking fee, non refundable. Pony or Horse Rides, Staff lead for all ages! Click here to view details about pony parties at Heberle Stables. Click here to view details about pony parties at your location.